A dubious milestone for bi-partisan alignment was achieved in the ninth Democratic Debate: The spectacle of gladiators brutally goring each other with unforgiving invective, unconcealed contempt, and scorched earth denunciations is no longer the exclusive reality TV programming of the Republican Party. The tantrum-fest Thursday night in Brooklyn threatens the ultimate unification of the Democratic Party at just the moment when their hopes for the general election were buoyed by the fissures along the San Andreus–scale fault lines in the Republican Party. That the gloves would come off in Brooklyn, New York -- where casual insults (oh, yeah? and your mudda!) have long been the spice rack flavoring the most mundane conversation -- should not be a surprise. And the Democrats proved every bit as capable as their Republican counterparts in flinging petty taunts, oozing disrespect, and stretching accuracy from Grand Army Plaza clear to Coney Island. But unlike the panoply of opinionated candidates populating many Republican stages, the Dems have been airing two-person Hillary and Bernie re-runs for months with precious little by way of new content. With little novel revelation about policy or substance, the only levers the candidates could manipulate to make their points were to scream louder, become more indignant, and amp up the outrage. But what turned this debate into an elbows-flying sandbox brawl is one irrefutable fact: Tuesday’s New York primary could trigger a dizzying downward spiral for the loser. In this very debate, Bernie Sanders himself raised the stakes to def-con five: He sought to diminish the significance of Hillary Clinton’s delegate lead by attributing it to a small number of overwhelming wins in Southern states, “the most conservative part of the country.” There was no possible alternative interpretation of this comment other than the notion that Sanders believes he will therefore win in the most liberal states. Uh, like New York… where he is currently down 10 to 17 points in the polls. On the other side of the coin, New York State is home turf for Hillary Clinton. She was twice elected its Senator. For all the irrefutable arguments about delegate math, a Hillary loss in New York would be a humiliating blow. It might not cost her the nomination, but it would be nuclear-grade fuel to the entertainment news establishment that sees ratings in controversy. It would be the loss that keeps on losing. So make no mistake: this debate was a high-octane combustion chamber that only needed a spark, and it didn’t take long, or much, to light the joint up. For those who bothered to try to hear the substance underpinning the graceless anomie, there was actually a very pristine and coherent contrast in world-views. Bernie Sanders has cast a unifying theme that only truly hyuuuoge, radical change can save American democracy and, quite literally, the planet, from its current trajectory of decline toward destruction. He is demanding change that is comprehensive, urgent, and seismic. He delivers his message with a soaring and idealistic oratorical reach that coaxes 20-somethings toward philosophical climax. Hearing the crowd last night, I am no longer sure that “Feel the Burn” is just a figure of speech. In the other corner, Hillary Clinton has doubled-down on her adopted persona as the de facto incumbent President of the United States. This requires her on the one hand to absorb punishing blows for shortcomings real and imagined in the Obama White House on top of several of her own controversial adventures as Secretary of State. But it also gives her the power to dismiss Sanders as just so much inflated gas; a man who paints pretty pictures but lacks any practical experience in accomplishing goals in the real world. Her mantra for the debate: anyone can diagnose the problems; the hard part is finding and implementing the solutions… solutions that really work in a gridlocked federal government and in an ever-increasing number of global hot spots with a wide variety of conflicting and competing constituencies and interests. This was the evening: Bernie Sanders was given to soaring, radical oratorical flourish, and Hillary Clinton dredged the trenches of detail, compromise, gridlock, politics, and real world limits. Is she qualified? Oh, pul-lease. The very first question went to Bernie Sanders, asking him to reflect on his recent statement that Hillary Clinton is not qualified to be President of the United States. Three days ago, Bernie had the wisdom to walk that one back all the way to Montpelier, stating that on their worst days, both Democratic candidates are vastly better than their Republican rivals. 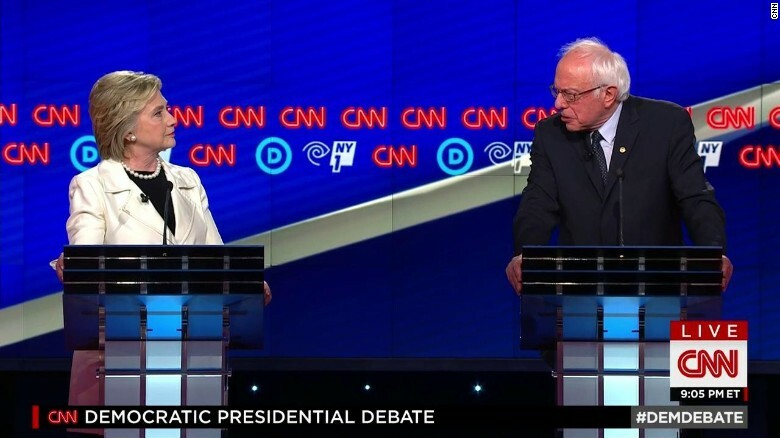 In this debate however, Bernie breathed new life into this controversy by conceding that Hillary had the experience to be President but questioning whether she has the judgment. Now, let’s reflect on that one for a moment. Let’s postulate that Bernie’s goal is to persuade people who currently favor Hillary or people who are currently undecided between Hillary and Bernie. Let’s further note that he is currently focused on people who live in New York, and let’s finally presume that these are likely to be people who support President Obama. Does it really make any sense to contend that the twice-elected Senator from New York and the person Barack Obama trusted to be his Secretary of State lacks the judgment to be President? There’s rhetorical flourish, and then there is launching wayward rhetorical blasts that soar with the accuracy and power of Kim Jong-un’s missiles. C’mon, Bernie. Hillary Clinton hit back extremely hard, citing her record as a Senator from New York and her years as Secretary of State. Indeed, the exchange set the ferocious tone for the evening. But it also seemed to color Sanders from the very outset with a wisp of desperation. Asked to back up his assertion about Clinton’s judgment, Sanders cited (of course) Clinton’s vote for war in Iraq and her embrace of “big money interests.” The moderators challenged Sanders to name one specific decision that he could prove Clinton had made favoring the banks from whom she had received money. God is in the details. Unfortunately so is the devil. However, the discussion of Clinton’s cozy relationship with Goldman Sachs led to her weakest performance of the evening. When Sanders demanded that she release transcripts of her speeches to Goldman Sachs, Clinton blatantly cowered behind a false equivalency that she would release the transcript “if everyone else was required to do the same,” implying that other candidates exist who are in the exact same position as her and are not being held to such a standard. Since no such candidate seems to exist – and certainly not in the primary contests for the Democratic nomination -- the effect was to lend credence to Sanders’ assertion that she has something significant or embarrassing to hide. It didn’t help when she tried to turn the tables away from her and make a cause célèbre out of the fact that Bernie hasn’t released his tax records; most sane people rather doubt they will find Bernie’s name on a Panamanian bank’s withdrawal slip. This was followed by an uncomfortable sequence on the question of whether the national minimum wage should be raised to $15.00. Once again, Bernie had that moral and oratorical high ground of a liberally pristine soundbyte, as the $15.00 minimum is a position that Bernie Sanders has embraced unequivocally. In contrast, Hillary Clinton, policy-wonk-in -chief, attempted to explain why such a move was neither practical nor even necessarily a positive step for the very people it seeks to help, and needed to be evaluated state-by-state and even factoring in urban vs. rural environments. But her meandering treatise made her appear to equivocate and led everyone to think she was just trying to have it both ways. For a candidate who claims to have such a granular command of detail, both of these performances were sloppy, evasive, and made her appear to be wall-papering over the truth. The discussion of guns and the gun lobby is never a happy one for Bernie Sanders. The very essence of Bernie’s Sanders’ candidacy – the self-professed raison d’ être for his candidacy – is that he is not in the pockets of big money, big oil, big Wall Street, big pharma, big establishment, or big anything. Of course, the problem with purity is that it is greatly compromised by the presence of even the slightest impurities. It seems that with each and every debate, Hillary’s oppo team has dug up yet one more murky detail about Bernie’s voting history on gun legislation. This time it was a section from Sanders’ own book that implied that his 1990 congressional race had been aided when the NRA ran ads against his opponent. Bernie has a strong liberal record on second amendment issues. The problem, however, is that he has centered his entire candidacy on his independence from special interests. His record on guns per se may not be damning; but the fact of his past support for NRA positions is a scalpel that Hillary Clinton is using to undercut the integrity of his candidacy. In this exchange, the soaring “no big money” rhetoric from Sanders was gunned down by gritty details from Clinton’s ground war. Climate Change: the ultimate debate of radicalism vs. incrementalism. At no point in the evening was the philosophical contrast between the candidates more clear than on the issue of climate change. Bernie Sanders wasted no time in laying down the gauntlet, likening the threat posed by climate change to a military war waged by an enemy that threatens our very existence. When confronted by such threats in military conflict, we galvanize our resources and industry to preserve our democracy and form of life. From this high ground, he pilloried Hillary for supporting fracking in the international community. Once again, Clinton returned to her mantra: “It is easy to diagnose problems, it is hard to solve them.” She pointed out that natural gas represents a dramatic improvement over coal in terms of impact to the environment, and that natural gas therefore represents a crucial transitional solution until wind, solar, and other forms of renewal energy are operating at scale. Clinton proudly pointed to the Obama administration’s leadership in bringing 190 nations together to reach an accord on climate policy in Paris; Sanders pooh-poohed Paris as just so much piling of paper as Rome burns. Global climate change was the issue that provided the most discerning contrast between the candidates. Bernie raged against the timidity of incrementalism, and Clinton belittled the impracticality and ineffectuality of bombast and theory (“I don’t take a back seat to legislation that you haven’t been able to get passed”). In a lively discussion about whether Israel’s counterattack on Hamas in Gaza was disproportionate, Bernie Sanders asserted that the attack indeed was, and that “if we are ever going to bring peace to that region we are going to have to treat the Palestinian people with respect and dignity.” He emphatically stated that “there comes a time when we cannot say Netanyahu is right all the time.” Clinton’s scorching retort leaned heavily on her detailed knowledge of Hamas’ terrorist strikes from bases in Gaza, and on her personal experience closed-door negotiating sessions with the most senior leaders of the parties. She leveraged the nuanced understanding gained from her years leading the state department. Advantage: Clinton. CNN moderators pressed Bernie Sanders to provide the details and likely costs of his proposals to provide a free college education to anyone who wishes it, and to provide universal healthcare through changing from the Obamacare to a new single payer system. His response was bold assertion: if other countries can accomplish these goals, they must be achievable for the United States of America. Clinton’s reply was pure realpolitik: it took every ounce of muscle to get the Obamacare passed through a gridlocked government; it simply defies any sense of reality to believe that dismantling it is the right way to get from 90% coverage to 100%. As the debate faded to black, and the combatants returned to their corners, I realized that over the course of the 21 debates we’ve now covered, a simple pattern has emerged. On the Republican side, gaffes, outrageous statements, and weak performances shook the race seemingly on a weekly basis. Just look at Marco Rubio’s blood pressure readings from mid-January to March and you’ll see how much impact the debates have had on the GOP race. But on the Democratic side, the dynamic has been largely the opposite. Two extremely seasoned, knowledgeable contenders have been going toe-to-toe for nine debates, often hearing the same questions, the same responses, and seeing the same results. Most remarkably, in those 18 hours on stage, there has not been a significant gaffe by either contender. Not one. The effect is that the debates tend to re-inforce ingoing opinions rather than change minds. And it’s comfortable to conclude that this happened yet again in Brooklyn. If I had to give an edge in this debate, it would be that Hillary’s oft-repeated mantra – “it’s easy to diagnose problems, it’s hard to find solutions” – proved to be an effective way to leverage her considerably greater tenure in the center of the action on the world stage. In Brooklyn on Thursday, the only news was that the candidates finally seemed to boil over and let the vituperation fly. There was none of that “with all due respect to the senator;” it was gritty and tough and the elbows were flying. Call it a New York State of mind. The worry for the Democrats has to be whether the long-term impact of nine debates will be to create rifts and wounds that are slow to heal. Both of these candidates desperately need the other’s base in order to win in November. Yes, Hillary was pilloried, and Sanders may have been slandered. We continue to bet that the math behind Clinton is inexorable, and a win in New York could certainly set her up to run the table. But the question to ask is whether coming out of Brooklyn, bridges were Berned.